Support from the community helps the Irvine Animal Care Center provide advanced care to homeless pets. 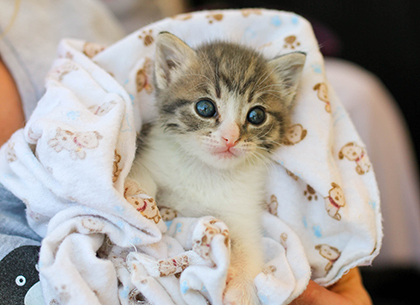 The Irvine Animal Care Center provides quality care for abandoned animals. In addition to day-to-day operations providing veterinary care and the basic necessities, support from the community helps the center provide enhanced medical care, high-quality food, and bedding, and programs such as Third Chance for Pets. You don't have to adopt to support the animals at the Irvine Animal Care Center. The IACC sometimes receives animals in poor condition that have been injured or neglected for long periods of time. The Enhanced Care program funds the additional medical treatments these animals require to become healthy (i.e., eye surgery, a broken limb, x-rays, tooth extractions). Choose Enhanced Care as your designation. This program allows the center to transfer animals from overcrowded shelters that otherwise may not find a home. When kennels are available at the center, staff can bring some of these animals to the center for adoption. Since these animals come from outside of Irvine, their care is partially funded through donations. Without the generous support of donors such as you this program could not exist. Choose Third Chance for Pets as your designation. The center accepts donations of new, unused pet food, toys, kennel supplies, and more. We've created a handy wish list if you'd like to shop at your local pet store, or you can use our Amazon wish list and have items shipped to the center. Download the Communities for Cause free app here, and start donating while you dine and shop in Irvine. Use your Ralphs Reward card to support our homeless animals. For more information, visit the Ralphs website. Other animal-related resources can be found on the center's Resources webpage. Locally based charitable organizations related to animals can be found on the City's Charity Directory. For more information on Irvine Gives, the City's online resource to local giving opportunities, visit the Irvine Gives webpage. The Irvine Animal Care Center currently has new volunteer recruitment opportunities available in two areas: Rabbit Care and the Foster Care program. Learn more and sign up for a volunteer workshop here.